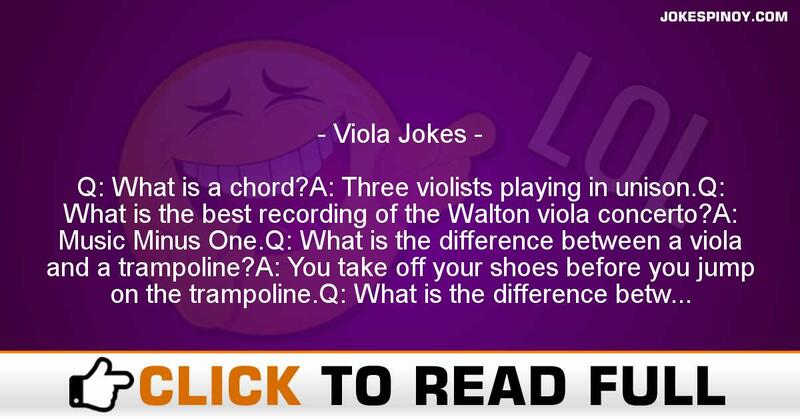 Q: What is a chord?A: Three violists playing in unison.Q: What is the best recording of the Walton viola concerto?A: Music Minus One.Q: What is the difference between a viola and a trampoline?A: You take off your shoes before you jump on the trampoline.Q: What is the difference between the first and last desk of a viola section?A: Half a measure.Q: What is the difference between grapes and a viola?A: You take off your shoes to stamp on grapes.Conductor: Again from measure 5, if you please.Voice from viola section: But Maestro, we have no measure numbers.Q: What is the difference between a chainsaw and a viola?A: If you absolutely had to, you could use a chainsaw in a string quartet.Q: What do you call a person who plays the viola?A: A violator.Q: What is the difference between the first and last desk of a viola section?A: A semi-tone.Q: Why are violas so large?A: It is an optical illusion. It’s not that the violas are large, just that the viola player’s heads are so small.Q: What do you call the folks who hang around the musicians at conservatories?A: Violists.Q: What is the difference between a dog and a viola?A: The dog knows when to stop scratching.Q: Why can’t you hear a viola on a digital recording?A: Recording technology has reached such an advanced level of development that all extraneous noise is eliminated.Q: What is the definition of a major seventh?A: A violist playing octaves.Q: How is lightning like a violist’s fingers?A: Neither one strikes in the same place twice.Q: Which positions does a violist use?A: First, third, and emergency.Q: Why are orchestra intermissions only twenty minutes long?A: So the violists don’t need to be retrained.Q: When a 16-inch viola and a 17-inch viola are dropped simultaneously from a 30-story building, which one hits the pavement first?A: Who cares!Q: How do you get a viola section to play spiccato?A: Write a whole note with “solo” above it. ABOUT US : Laughter is the greatest medicine as the old saying says, we at JokesPinoy.com will give you all the comical filipino quotations and photographs in tagalog language. Back in 2013, a group of Filipino OFW (Overseas Filipino Worker) got bored and they attempt to look for some amusing quotations on the net simply to have fun but unfortunately most of the websites they discovered on that time are having an obsolete jokes and have no interaction with the users. From that moment, they subsequently got an idea to build their own jokes website and let other users to give their jokes or comment with the existing jokes. Following the funds and concepts accumulated, JokesPinoy.com was born, a website that let the user share their jokes and let them have dialogue with other users as well. Since the website has been launching, thousands of visitors are coming each day to read jokes and have fun on the website and too as giving their opinion on the jokes they read. We expect from JokesPinoy.com that this website may give you some grin and happiness, Life is Short so have fun on it. DISCLAIMER: A number of the jokes, pictures and videos found in this site aren't created by us, they can be created by our users or they just get it somewhere in the internet just like 9gag, youtube, metacafe, vimio and etc. We respect copyright info which is posted here including funny pictures and funny videos. If encase there are files posted here in our site which is owned by your and you don't desire to share it to anybody then fell free to contact us to remove it. Most of the language used on this site was in tagalog and some are bisaya that are both filipino language which originated from Philippines, in case you need to interpret the joke to english you can used an online translator to translate it from tagalog to english.